Welcome to Apple Harvest Week at Red Couch Recipes. At the Red Couch Home we are devouring apples; all week long I will be sharing our apple recipes. 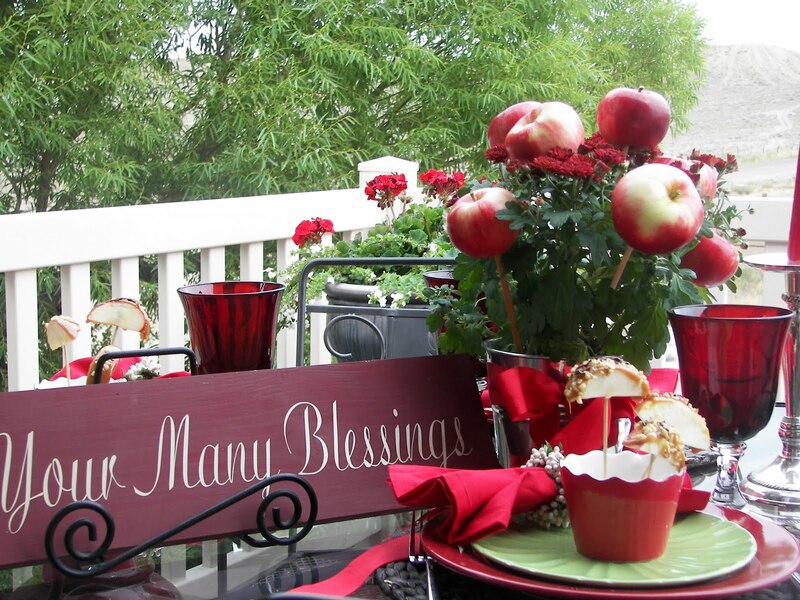 My tablescape highlights the reds and greens of apples. The placesetting. Oops! I didnt realize you could see the styrofoam. My version of a Better Homes and Gardens magazine centerpiece. I bought a mum and put it in a metal pail. I stuck apples on dowels and placed them in the mum pot and....voila! What a simple and fun autumn centerpiece. I wouldn't go anywhere without my Style Sisters napkin rings. Apple trees are surely one of Autumn's greatest blessings. The sign, although cut off, says Count Your Many Blessings. Today's treat is Caramel Apple Bites. These are perfect for kids who never want to eat the whole Caramel Apple. I do make homemade caramel sometimes, but these are made from wrapped caramels. Just follow the directions on the package for making caramel apples. Cut apples into slices and spear with wooden skewer pieces. Spread the heated caramel with a spoon and sprinkle with nuts. Drizzle with chocolate. The skewers are anchored in styrofoam in the ramekins. Come grab a Caramel Apple Bite on your way out. Thank you for strolling through the orchard with us at Red Couch Recipes. Don't forget to join us all week for Apple Harvest Week. love the centerpiece. . .will have to tuck that idea away! looks great! Everything looks so good. I love the centerpiece and what a great idea for the caramel apples. I can't eat the whole thing and this is perfect! Your table looks like September to me... apples! What a cute fun centerpiece. There is just something about a red tablescape. I hope you will post your carmel apple recipe. It sounds delish... and even the carmel bites look wonderful. Cute table, fun center piece, and everything's always better on a stick!!! 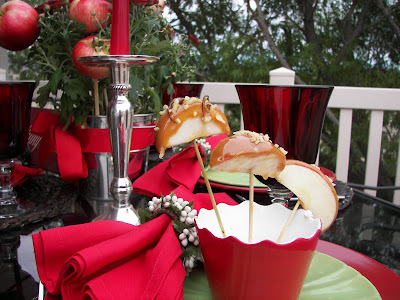 Now I would have never thought of putting apples on a stick and using them in an arrangement.....yours looks great! So pretty!! I love it. And now I want a caramel apple! Beautiful! The apple bites are such a great Fall treat. Joni, caramel apple bites are so yummy and definitely say "Fall." These look wonderful. What a great idea to cut the apples. It makes them so much more managable to eat. Fall is my favorite season and I love apples. I, too, love Fall and apples:) I also love your apple centerpiece and the caramel apple bites-great idea! Can't wait for the rest of the apple recipes this week! BTW Joni, you won the giveaway at Munchkin Munchies! Congrats! Just email me your address and your package will be on its way. Delicious and beautiful. You are so talented!! Great table and clever centerpiece! Those caramel apple bites look delicious, and I am definitely going to try those with my grandchildren. We are all about apples around here this week too. I've made applesauce and 2 apple cakes already this week. I love the idea of the bite size caramel apples. So much easier to eat! We'll be picking apples on the weekend - at least all those that the deer and raccoons haven't picked! OH...now this I love love love! Apples, Red, green. Everything looks fabulous! I love the centerpiece!! That is just perfect!! Thanks for linking up! I'm just coming over from Karin's Centerpiece Wed. party! Ohhh my, you certainly have set a beautiful table, my friend! 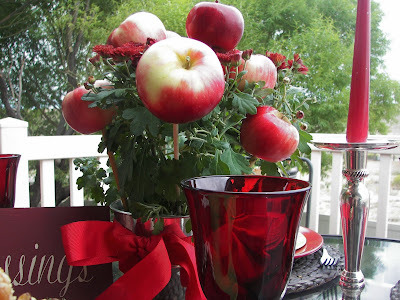 I love apples and I love the way that you have used them to decorate! 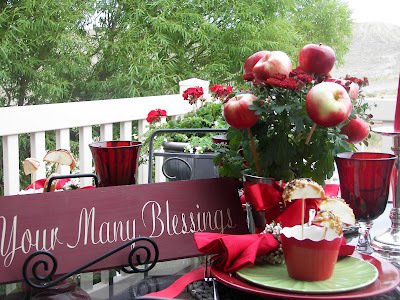 What a GRAND idea...to add the apples to your mum centerpiece...I love that idea! Mmmm...and after taking a peek at your caramel apple bites...I am sooo hungry for a good caramel apple! I can't tell you the last time that I had one! Thank you so much for sharing your beautiful apple tablescape with us...as well as the recipe for the caramel apples! PS...I am also sharing a tablescape for the party today! I used red and green too! Hehe! Come by when you get a chance! This is so cheerful. I love the apple-I used apple this week too. 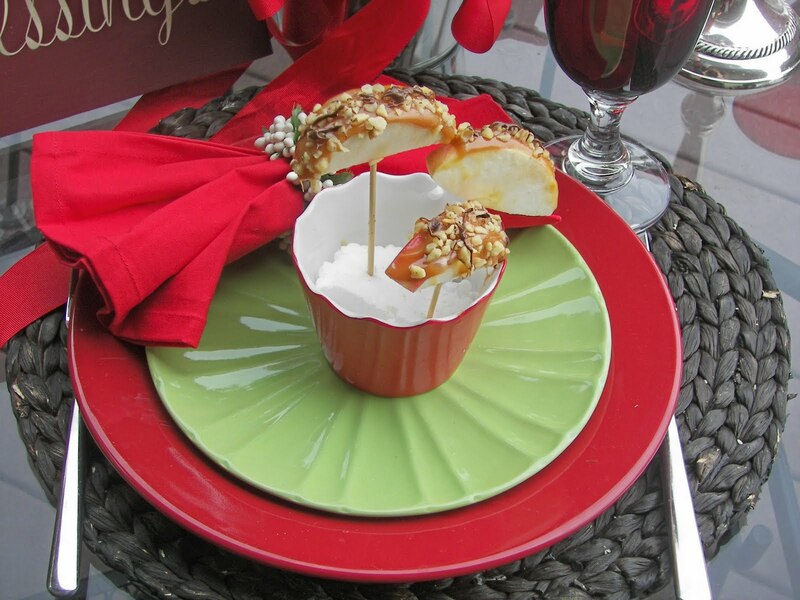 I love how you skewered the sections of apples. 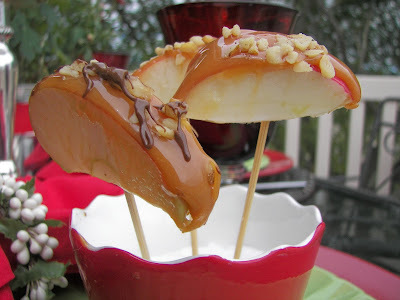 I will definitely be using this idea when we make caramel apples! How unique! The apple theme is just beautiful! I would love a caramel apple bite! Oh yum! 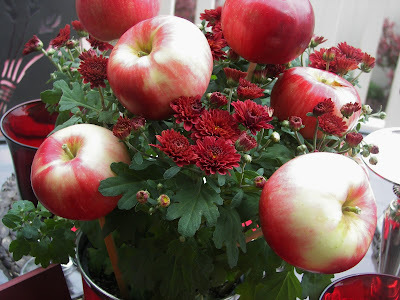 I love the apples mixed with the flowers -- what an utterly delightful idea for fall -- I'm stealing that idea! What an adorable table and those caramel apples look delicious! What a fun and cheerful table! And not too mention a yummy looking table! Looks great, J! make the apples whole and then slice them to serve, like your idea! Absolutely beautiful ideas and photography! The recipe sounds equally spectacular. I loved this post! Carmel apples are always so difficult to eat - the apple bites are the perfect answer. I love your red and green table - the perfect table for September. 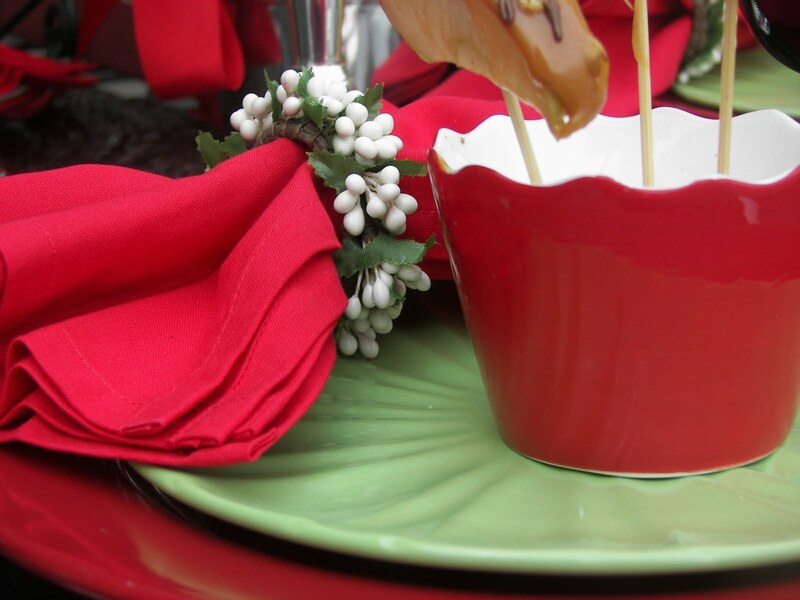 Great centerpiece...love the green with the red. I love your caramel apple bites! Will make those for sure. Thanks for sharing your ideas and your lovely table. I love the centerpiece! What a great idea..love the caramel apples too. What a fun tablescape! Thank you for sharing! What a wonderful centerpiece idea! I just love it and it is perfect for fall. The whole table looks just wonderful. I love the caramel apples. The table is just beautiful. I love apple decor so this really appealed to me! Thanks for sharing. 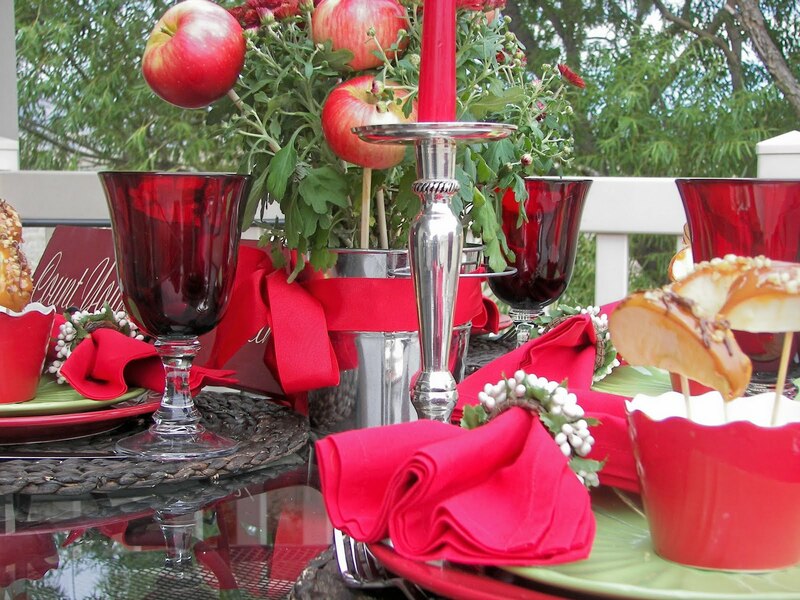 Love your pretty tablescape, especially the centerpiece and your napkin rings. I'm behind in my visiting and also just read your post for Tablescape Thursday last week. Both tables are colorful, cheerful and creative. The parrot salad plates are adorable! I really do love your blog, Joni. Yummy caramel apples! This is the cutest and most delicious idea for a tablescape. I like the use of the red and green colors with the apples. Pretty outdoors and fun photos. Oh this table makes me happy! Apples are just so pretty and I love caramel-ed ones with nuts. Love your mums and apple arrangement too. Don't be surprised if you get a call from an editor at Better Homes and Gardens!